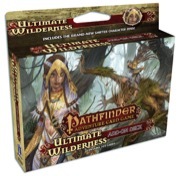 Based on the storylines of our most popular Pathfinder Adventure Paths, this cooperative card game allows you to explore locations and overcome challenges as you improve your own character deck. Each Adventure Card Game base set comes with several character options, and takes you through the first Adventure Deck of a given Adventure Path. Your character will accrue new allies, items, weapons, and more as you play through each Adventure Path. By starting a Pathfinder Adventure Card Game subscription, each release will be automatically bundled with any other Paizo subscription items you're subscribed to releasing in the same month. I'm definitely subscribing. We playtested this game like crazy, and my group is still clamoring for more. 1. Is this a "standard" paizo subscription (which will release on the same day each month that all the others do)? I had a vague memory of this being a licensed product like the minis/comics, although I see you are listed as the publisher/manufacturer. 2. Am I right in thinking there will be future "base sets"? Something like a base set, then five expansions tied to that over the year, then a new base set? OK, solo play option looks like a winner to me - I'd better give it a go. ...but then I find it's going to cost $85 for delivery, so we might just wait to see the price in shops here, instead of subscribing. The initial box is something like 6 lbs so it is likely going to be most economical for most international customers to get it from a local gaming store. However, you might consider subscribing starting with the 2nd volume until the end of the first series. The shipping on those will be a great deal less since it is a card expansion instead of a whole box. We are publisher; standard sub, same release date as other products. If this one does well, we will consider new base sets for other Adventure Paths. However, for at least a year Rise of the Runelords will keep us busy. Ah, that makes sense (although I have no concept of how heavy 6lbs is, I can see that's it's a fair bit - 500 cards worth!) so I'll give your suggestion a try. Any word from the play testers as to how solo play went? I currently have a subscription for the items cards and enjoying handing them out during game play. Just curious how interesting or helpful these new game cards might be to incorporate into role playing sessions as well? They are designed with stats for the card game, not the RPG, but if you just want to show your players pictures of items, places, people, and monsters from Rise of the Runelords, this does actually make that pretty easy—there are several hundred different pieces of artwork in the full set. Do these use new art or is it all older stuff? Reggie, a kilogram is equivalent to 2.2 pounds. So roughly the package weighs 3 kilograms. I wasn't one of the formally selected solo playtesters (we were a playtest group of 3), but I did some solo play. I quite liked the solo play, but occasionally got into a situation I just couldn't realistically overcome by myself. This makes the game harder in solo play, which is totally fine by me, because I thought it a smidge too easy in our group play. One of the solo playtesters may chime in to give more specifics. I know that development team took a lot of their comments into consideration regarding solo play of this. Tamago, I'd suggest getting the character add-on deck anyway to give your players more options, because every character plays completely differently. I personally loved the monk's and druid's play styles, and even if I was never planning to play with more than 4 players would want the character add-on deck just for those. If we had to commission all new art for the hundreds and hundreds of different cards in the Rise of the Runelords set, the art budget would make the product unfeasible. That said, there's a fair amount of brand-new art here (including the all-new Wayne reynolds cover painting). We advise solo players to run two characters, offer some suggestions about which characters are suited for solo play and which are not, and offer some advise about how to deal with cards that you can't reasonably overcome. Yep—you can make use of the Character Add-On Deck even if you never have more than 4 players. And though it does offer more copies of some of the cards from the Base Set, in addition to the four new characters, there are more than a dozen other cards unique to the Add-On Deck. I note there is no option to start the subscription with the add on deck if I wanted to do this ( as noted international shipping is high) I'm assuming starting a subscription and explaining things to the nice customer service people would work? We have a bit of work to do on the code behind starting options here. I'm not quite sure how that will shake out, but at the very least, you should be able to start with the Add-On Deck as soon as the Base Set is released. Are there any videos available of the playtesting of this product? As far as I know, nobody has done that. We've talked about it a little bit, but it's certainly not something we'd do until after we have proper printed cards, which will still be several months yet. So the adventure path will be in august 2013, but where i can find soem material to test the base board game?? This release is the base game. Yep—the Base Set, due in August, includes the first chapter of the Adventure Path. Very interested in how the game plays. I would consider the subscription if there was a way to subscribe through my local store. I like having someplace to go and find new people to play games with. What are the chance of getting like a pdf of the rules, even rough version, I would be willing to sign a Non-disclosure form, I just really want to get any idea of game play! We'll be releasing a free PDF of the rulebook a few weeks before the game's August release. Will future products revolve around current adventure paths or will there be adventures unique only to the card game? To answer that, I need to introduce a bit of terminology. The Base Set box includes an adventure called Perils of the Lost Coast, which encompasses three scenarios set around Sandpoint, none of which are adapted from Rise of the Runelords. One of the three is actually adapted from "Black Fang's Dungeon," the adventure in the Pathfinder RPG Beginner Box, while the other two concepts come straight from the mind of James Jacobs, and are unique to the card game. The Base Set box *also* includes the Burnt Offerings adventure, which presents scenarios adapted from the first chapter of Rise of the Runelords. The other five chapters of Runelords will be adapted in bimonthly Adventure Decks; that takes us through a full year of releases. So yes, there are scenarios unique to the card game, but they're not in future products—they're in the Base Set! During the playtest there was also talk about how to construct your own scenarios and adventures. I am not sure if the base rules will contain any suggestions or if that may come later. The game looks to have a fair amount of flexibility and re-playability. Our 6 player group playtested the last two chapters of the adventure path but I also did solo play with the basic set scenarios and the chapter 5 and 6 ones. I look forward to seeing the final version. I expect that it will play better with real cards and have a richer experience with the final artwork and flavor text. So exactly how many scenarios and adventures are in the base set? "Perils of the Lost Coast" is a 3-scenario adventure. How many scenarios make up "Burnt Offerings"? 5? I believe that is correct based upon the card list from the playtest. After the starter box, I think each chapter will have 5 scenarios. Each Adventure Deck contains 5 scenarios. There's a *very* brief sidebar that provides advice for making your own story, character, and role cards. I clicked on the subscription button and it went into my shopping cart. When I looked at the shopping cart, it says there are 2 items in my cart. I opened the cart and it only shows one Item. I am confused. Could you look into this for me. Edit: I should have said the sub-total says there are 2 items in my cart. Just had a test, and I believe that item 1 is the subscription itself, and item 2 is the first item in it, specifically the base game. I am very excited about this product. My boyfriend and I have signed up for the seminar at Gen Con and will be bringing back the rules and teaching others down here in Florida to play it. We will also be running a slot at our convention in October. About how long does one of the adventures last (we need to know for planning purposes)? Would you be willing to release any tips for explaining it to people at conventions? Based upon the playtest, the length of time it takes to play will depend upon the number of players that you have. In round numbers, I think that it is safe to say that each scenario takes between 1 hour and 2 hours to play. Each adventure has 5 scenarios so it will take between 5 and 10 hours to play. I think it will be closer to 10 hours because of the setup and between game deck maintenance. You may also need to replay a scenario that you initially fail. About how long does one of the adventures last (we need to know for planning purposes)? It depends on the number of players and how familiar with the game they are. 6 players trying to figure out the game for the first time might need two hours; two or three players who know the game well might finish a scenario in 45 minutes. Would you be willing to release any tips for explaining it to people at conventions? We're still in the process of designing that, but I don't see why not. We're shooting for our demos to last 45 minutes or so. Vic, just a suggestion... maybe once you have the demo down as you like it, there could be a video posted on YouTube with the demo for folks who haven't had a look at this game yet (like myself). We are talking about ways to get a demo video made, yes. Is this game going to be a Gencon release? And if so, if we subscribed, could we pick up at Gencon?